"What is soft, fluffy, and white? Pablo’s wool, of course. But this little lamb soon discovers that there’s something else as well: SNOW! From making trails to sledding with friends, having snowball fights and crafting snowmen, there’s tons of fun to be had in the snow. 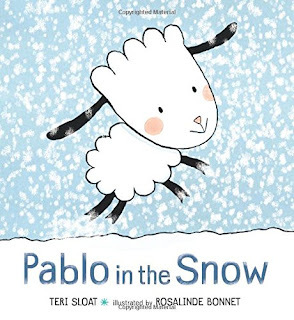 But winter days grow dark very fast, and Pablo finds himself lost on his way home. Not to worry―Mama and Papa help Pablo get back to the cozy barn so he can talk about his adventures." Well, as a fan of snow myself, this was a pretty dang adorable book. Pablo's first interactions with snow were cute! ...if predictable. And there's really not a whole lot to the story besides snow; the briefest of interactions with friends and family, but really, it's a highlight of what one can do with snow. The illustrations are soft, simple, and well done, though not particularly noteworthy. Really, overall, it's something I'd keep in mind for a winter storytime. Not necessarily at the top of my list, but I wouldn't discourage anyone from reading it! Especially if you love snow as much as I do. "Rabbit is excited. He is going to surprise his good friend Robot at home. DING DONG! When Robot opens the door, he is surprised. He wasn’t expecting Rabbit. In fact, he is already engrossed in a game of checkers with another friend, Ribbit. Now Rabbit is the one who is surprised, and a bit jealous. While Robot thinks everything Ribbit says is humorous, all Rabbit hears is "ribbit." And Ribbit eats flies with her popcorn. Gross! When Rabbit and Ribbit get mad because they both want to be Cowboy Jack Rabbit, Robot’s Emotion Decoder overheats, leaving him out of commission. Can Rabbit and Ribbit find a way to work together to revive their friend?" Ah, the ever troubling conundrum of three friends playing together, instead of just two. 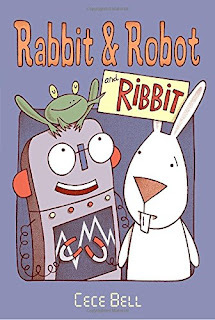 Especially when one friend (Rabbit) doesn't know Robot's other friend very well (Ribbit). This story carried Bell's signature subtle humor while still teaching a good message about friendship. The illustrations are cartoon-esque, which fits the comical nature of the story. The text was a tad difficult in places; I often got confused between the rapid interchanges between Rabbit and Robot and Ribbit. But, I did appreciate the vocabulary lesson for the word, "engrossed." Overall, not a whole lot of action or adventure, but a fun friend story for kids. Add it to your early reader's lists for sure. "Fourteen-year-old Doreen Green moved from sunny California to the suburbs of New Jersey. She must start at a new school, make new friends, and continue to hide her fluffy tail. Yep, Doreen has the powers of . . . a squirrel! "After failing at several attempts to find her new BFF, Doreen feels lonely and trapped, like a caged animal. Then one day Doreen uses her extraordinary powers to stop a group of troublemakers from causing mischief in the neighborhood, and her whole life changes. Everyone at school is talking about it! Doreen contemplates becoming a full-fledged Super Hero. And thus, Squirrel Girl is born! "She saves cats from trees, keeps the sidewalks clean, and prevents vandalism. 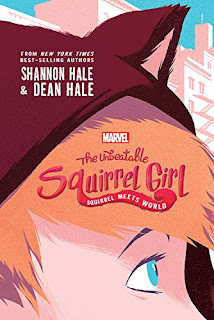 All is well until a real-life Super Villain steps out of the shadows and declares Squirrel Girl his archenemy. Can Doreen balance being a teenager and a Super Hero? Or will she go . . . NUTS?" Squirrel Girl? Yeah, I was feeling as skeptical as you are feeling now. I have not ever heard of this minor Marvel hero, nor was I much impressed upon seeing the title. Turns out, it's an awesome, action-packed, squirrel-loving novel that has me appreciating all things squirrel. Doreen (aka Squirrel Girl) is a fantastic character whose quirky humor and pure optimism had me snorting more than I care to admit. But she has some needed depth, too, especially when friends and fans turn on her. Really, a well-done character. Is the story kind of random and farfetched? Well, yes, but not any more than you'd expect from teenage superhero story. I think the only thing that really bothered me were Doreen's footnotes. When reading from her perspective, sure, they added little hilarious asides and background info. But then the footnotes still appear when reading from the other characters' perspectives. Which felt weird...is she reading the book with me? Is she omniscient? I didn't always appreciate it. But still, a small complaint for an otherwise hilariously awesome superhero story. I'd recommend it to superhero connoisseurs and newbies alike.